deux clochers complètement différents, je resterais classiques avec une préférence pour le premier. 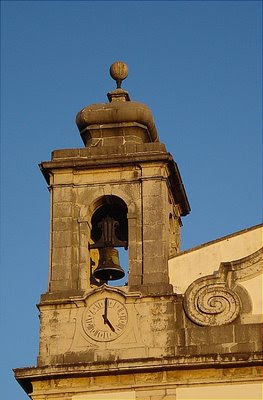 two bell towers are completely different, I stay with a traditional preference for the first. Nice contrast. I agree with Olivier. I prefer the first tower, but there is enough room for a variety of architectural styles as well. Those both look lovely against the deep blue of the sky! I like first the first tower, but the contrast is interesting. You have the bluest skies over there! Even our clear skies have a pinch of grey in them. If you ask me, the 18th century one wins hands down in terms of beauty. Wow, what a contrast! I think the first is much nicer. Both beautiful in their own way. Excellent photo's. No clock on the new one! We've had a few days of rain, so I needed a fix of blue sky! Thanks! From that angle ,I prefer the first one.. But I would have to see the whole thing before I am definitive ! That's a fantastic angle for both photos & I love that sky - it's gorgeous!!! Stark difference, but I like both of them. Wonderfully composed. Interesting architecture...great colors and contrast. Interesting idea to put them up against each other. I like them both. Love this idea and contrast. It's interesting to see how new architects are keeping old ideas fresh. 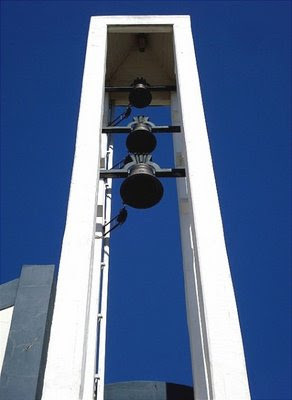 I really like these bell towers. They're awesome and I wouldn't mind photographing them myself!